Special Containment Procedures: Subject is to be kept in a secure box with a combination lock, code ██-██-██ in a standard fireproof safe with a number pad locking system. Neither lock will contain a backup keyhole. Within this context, SCP-1016 poses no threat. Approval of at least one (1) Level 4 personnel is required for the removal of object from its containment area for research purposes. Due to the nature of the device, testing may only be performed at the isolated building at Site ██ after making sure the building contains only D-class personnel. Description: SCP-1016 appears as a standard door key of unremarkable make. If placed on a keychain with two or more keys of a similar make, SCP-1016 will gradually alter its appearance to match over the course of several weeks. Regardless of form, the SCP may be identified by indelible bloodstains on the fob. 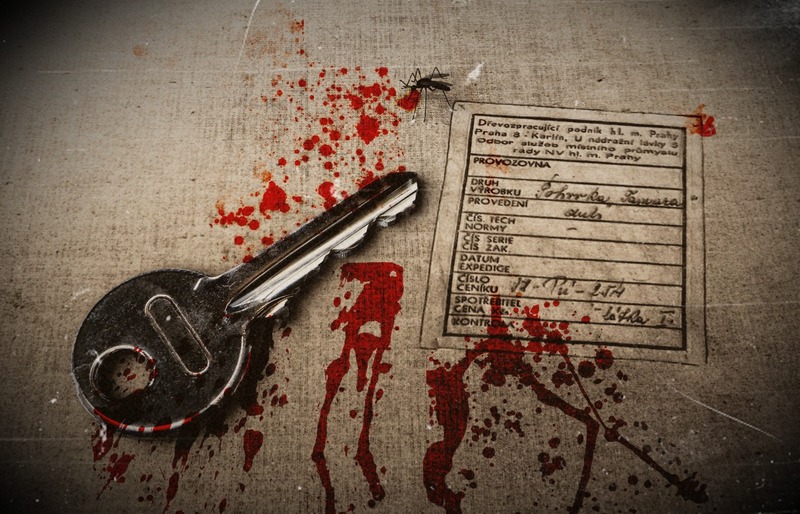 Bloodstains contain human DNA from 27 different specimens, none of which matches any individual on file. If left in place for more than two weeks, the surface SCP-1016 rests on will show evidence of similar bloodstains. The Foundation became aware of SCP-1016 upon review of the arrest of █████ ████████████ for the murder of his wife and two children. Anomalies and an allegedly airtight alibi triggered the curiosity of Agents ██████ and ████████████ who proceeded to investigate. Initially believing ████████████ to be the threat, SCP-1016 was transferred to Site ████ with his personal effects. Upon noting the unusual nature of SCP-1016, ████████████ was given a Class A amnestic and transferred to a different federal institution. When inserted into an unlocked mechanism, the key has no effect. When inserted into the locked mechanism of a door or similar barrier behind which are one or more mammalian lifeforms, the key will open the lock, and have its secondary effects. When SCP-1016 is inserted into such a lock, any lights in the structure dim noticeably. At such time, instruments detect no fluctuation in the power grid. The dimming phenomenon is noted with both electrical and incendiary light sources, and lasts until the key is removed from the lock or the door is opened past the frame. Following this, an additional presence appears in the structure. Experiments involving autonomously-powered video surveillance of the interior show the video monitoring devices to malfunction as power is restored, in a manner consistent with manual tampering; batteries are removed, lenses covered, or power is turned off. Upon the user entering the structure, persons and higher animals inside the structure at the time of the unlocking act are found to be dead. Cause of death in SCP-1016‘s victims is universally penetrating trauma with a large, bladed object. Victims bear wounds running along entire lengths of limbs, and in many cases appear to be partially dissected. In each instance, blood and organs from at least one victim will be arranged in what appears to be a specific pattern, although no consistent system has been found between instances. The interior of the residence will show signs of struggle, with overturned furniture, bruising on victims' intact skin, and [DATA EXPUNGED] being commonplace, despite no audible indication of this, even in the room just beyond the entrance. Even in situations where video surveillance would seem to indicate mere seconds passing between tampering and assault, the site contains evidence of struggles that appear to have lasted hours. The original activator of SCP-1016 never reports seeing or hearing anything definite, although upon their initial entrance of the structure, some subjects have reported having their attention inexplicably drawn to empty windows or doorways, or to hear breathing from an unlocatable source.